The Burbank Hospitality Association (BHA) is a public corporation created by the city council to administer public funds generated by a 1% tax on hotel stays in Burbank. The BHA has violated multiple campaign finance prohibitions in addition to open meeting laws in connection to their sponsorship of ‘The Committee for Yes on Measure B.” Public funds of at least $50,000 were gifted to unambiguously urge a particular result in an election which is a violation of state law. City staff members took part in the disbursement of these funds, which is also prohibited. Tourism Business Improvement Districts (TBIDs) are public-private partnerships created by city governments to collect special taxes and apply them to specific purposes. In Burbank’s TBID, public funds are collected by the city and are subsequently used to promote the tourism industry in the city. Burbank’s TBID, The Burbank Hospitality Association is a public corporation created by the city to administer the revenues generated by the TBID. It includes all hoteliers in Burbank with more than 25 rooms. At present, members of the TBID are assessed 1 percent of gross short term hotel stays. The City of Burbank is responsible for collecting those funds on a monthly basis. The Burbank Hospitality Association (BHA) does business in the city under the name Visit Burbank. The BHA has an eleven member board comprised of hoteliers, business leaders, one airport authority employee and one city employee. There are additional city employees who administer the funds and run the day to day operations of the TBID. The headquarters of the BHA is in the Community Services Building where most city business is conducted. 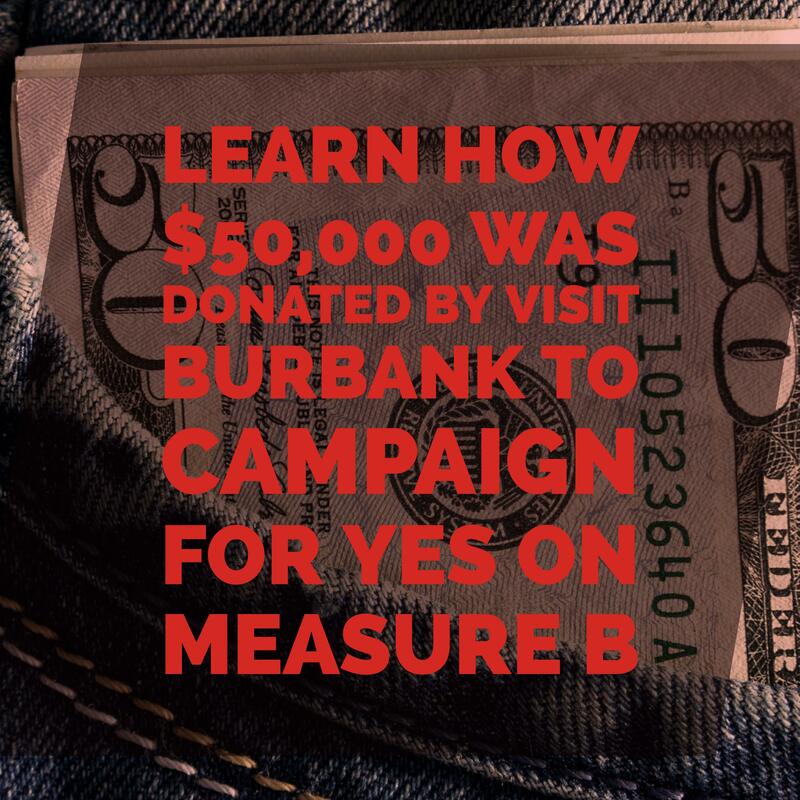 According to public records obtained by a Freedom of Information Act request, on September 23, 2016, the Burbank Hospitality Association made a $50,000 contribution to the “Committee for Yes on Measure B. ” A week earlier, on September 14th, Sunder Ramani, a principal officer of the “Committee for Yes on Measure B,” had attended the BHA’s monthly meeting and during Public Comments asked the BHA to make the $50,000 contribution to his organization. The vote to award the funds to the Committee for Yes on Measure B was voted on and passed in the same meeting which is a violation of the Brown Act. The vote was not reported properly to the public in a further violation of the Brown Act. 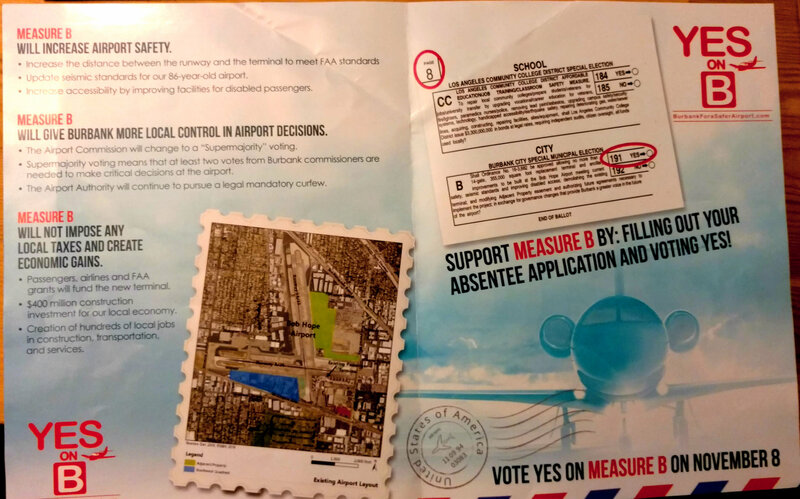 The Committee for Yes on Measure B did in subsequent weeks send out mass mailings as described by Mr. Ramani to households across all areas of Burbank. Furthermore, the Burbank Hospitality Association is a non-profit corporation formed by the City of Burbank for the purpose of administering the revenues generated by the TBID. A nonprofit corporation to which such administrative functions are delegated must comply with the same laws and regulations as the public entity that is delegating its authority. Epstein v. Hollywood Entm’t Dist. II Bus. Improvement Dist., 87 Cal. App. 4th 862, 873, (2001). Therefore, the Burbank Hospitality Association is bound by the same laws which govern the City Council. Thus, if the City of Burbank was legally proscribed from promoting Measure B, then so would the BHA. According to our (California) Supreme Court, “[i]n the absence of clear and explicit legislative authorization, a public agency may not expend public funds to promote a partisan position in an election campaign. Stanson v. Mott, 17 Cal. 3d 206, 209–10 (1976). “On the other hand, it is generally accepted that a public agency pursues a proper ‘informational’ role when it simply gives a ‘fair presentation of the facts’ in response to a citizen’s request for information [citations] or, when requested by a public or private organization, it authorizes as agency employee to present the department’s view of a ballot proposal at a meeting of such organization. (See Ed.Code, s 1073;7 cf. Citizens to Protect Pub. Funds v. Board of Education, supra, 98 A.2d 673, 677. )” Stanson v. Mott, 17 Cal. 3d 206, 221 (1976). The Burbank Hospitality Association used public funds (i.e., TBID tax revenues) to provide campaign materials or literature prepared by private proponents of Measure B, in violation of the Stanson v. Mott. These materials were dispersed in mass mailings that reached all corners of the city of Burbank. Records and minutes related to the BHA’s public meetings were not available online and had to be obtained by a Freedom of Information Act request. The Committee for Yes on Measure B has recently deleted it’s website and Facebook page and will be the subject of a sworn complaint to the Fair Political Practices Commission to follow this presentation to the public.